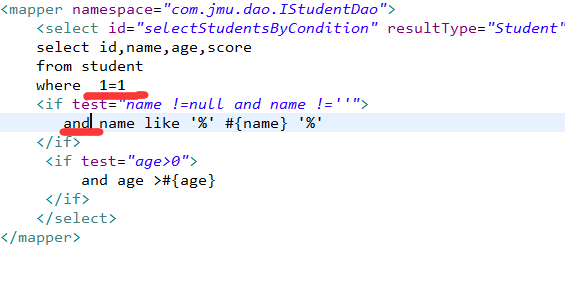 0 [main] DEBUG com.jmu.dao.IStudentDao.selectStudentsByCondition  - ==>  Preparing: select id,name,age,score from student where name like '%' ? '%' and age >? 0 [main] DEBUG com.jmu.dao.IStudentDao.selectStudentsByIf  - ==>  Preparing: select id,name,age,score from student where 1=1 and age >? 111 [main] DEBUG com.jmu.dao.IStudentDao.selectStudentsByWhere  - ==>  Preparing: select id,name,age,score from student WHERE age >? 104 [main] DEBUG com.jmu.dao.IStudentDao.selectStudentsByWhere  - ==>  Preparing: select id,name,age,score from student WHERE age >? 121 [main] DEBUG com.jmu.dao.IStudentDao.selectStudentsByChoose  - ==>  Preparing: select id,name,age,score from student WHERE age>? 7             <foreach collection="array" item="myid" open="(" close=")"
7             <foreach collection="list" item="myid" open="(" close=")"
6             <foreach collection="list" item="stu" open="(" close=")"